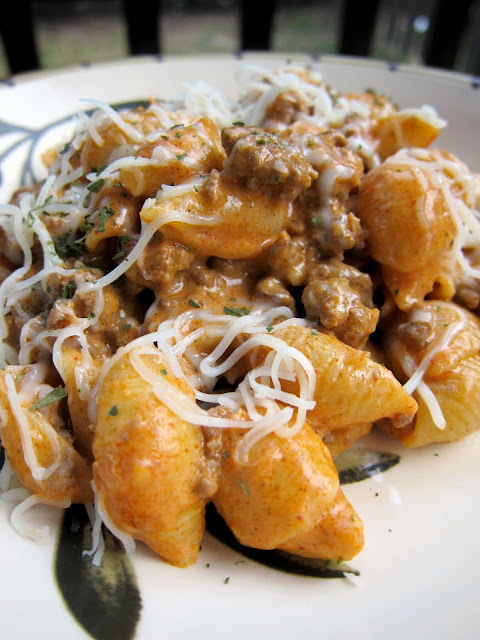 Taco Pasta - taco meat and pasta tossed in a quick homemade creamy sauce - SO good! Ready in under 30 minutes!! Kids (and adults) gobble this up!! Hamburger meat, taco seasoning, onion, garlic, salsa, pasta, sour cream and cream cheese. Seriously DELISH! I love Mexican/Tex-Mex food. I don't go out to eat it much anymore, so I am always on the hunt for a good recipe to try at home. I saw this over on Fake Ginger and immediately added it to our menu. I love quick and easy weeknight meals and this recipe fit both of those criteria. We loved this pasta dish. I had to make myself not go back for seconds. It was that good. It tasted like a taco, believe it or not! Shocking, I know, since the dish is called Taco Pasta. Give it a try on your next taco night. Meanwhile, in a large skillet, cook the ground meat over medium-high heat until no longer pink. Drain fat. Add onion flakes and garlic, cook about 30 seconds. Mix in the salsa and taco seasoning and let simmer over medium heat for about 5 minutes. Stir in the cooked pasta, cream cheese, sour cream and reserved pasta water, and continue stirring until the cream cheese is melted and the sauce is well blended. Season with salt and pepper to taste. Top with shredded cheese and more sour cream and salsa if desired. Southern Living has a very similar recipe (but with black beans and corn) that I've had bookmarked to make...but I guess I've been a little wary of the Mexican-pasta combination. Now I'm definitely trying it! Thanks for all your great recipes. It really helps add variety to my menus! That looks great! I luv stuff like this. My kids and I love taco night--my hubby--not so much. This recipe might fly with him! Another one saved - I may just start cooking everything you cook. You rarely make a dish that doesn't appeal to me. mmm, i really wanted Taco Bell tonight, but I think i'm going to make this instead. i just need ground beef! Crap crap crappity crap!!! I mean crud. I was looking for a recipe to make tonight and ended up making tacos instead. This would have been PERFECT for what I had on hand. Seriously. Saving it for the next time. I actually have my own version of taco pasta. It is good stuff and fast! I thought of it after making your pizza pasta, which btw, needs to be made again & soon! That looks SO GOOD and seems so easy to make - can't wait to try it. This looks yummy - I LOVE mexican and my family is always leary of my combos - I think they would eat this one up! This was an absolute hit at our house tonight! Thanks so much for the wonderful recipe! I made this and wrote about it here on my blog. Thank you so much for sharing this recipe. You always post the tastiest things. I made this tonight for dinner but double the pasta & sauce ingredients, except for the taco season, onion & garlic. It was a huge hit! Love your blog--thanks! Saw this on pintrest and made it tonight. Sooo good. Very difficult not to have seconds, although it's fairly filling. This recipe is GREAT!!! I substituted Protein Crumbles for the meat (fake taco meat..LOL) It was a great vegetarian comfort food. Thanks for sharing this!!! Just made this for lunch for my husband and I - in between studying. I am a super busy dental student always looking for quick and tasty foods! This hit the spot and would be great for single household and a large family! I made this last week and it was fantastic! So happy with the way it turned out. Thanks for posting so many great recipes - I have many that are on the list of things to make in the near future! Does this taste like hamburger helper? I don't like hamburger helper. Found this recipe on Pinterest and made it for dinner today. Was really good. Would definitely make again. Thanks! I made this and sooooo delicious! But so fattening! Lol As most things good are, eat sparingly! Yum! Great dinner. My son even likes it. Made this tonight with ground turkey, home made taco seasoning, fat free cream cheese and plain yogurt instead of sour cream. Also whole wheat rotini pasta. Quick and delicious. Hummm can't wait to make this mouth watering recipe... Thanks for sharing ! I made this tonight it was supper easy and supper yummy! I have a large family so easy and fast is a big plus! So thank you thank you for sharing this! The only extra I did was add some black olives, My husband loves them it made it even more delicious! I also sided it with refried beans and tostado shells. This is a new family favorite. has anyone tried it but not cooking the pasta first and adding it uncooked into the crockpot?